Last week the world discovered that Trump's meeting with Russian Foreign Minister Lavrov was a little more than meets the eye in that there was apparently a B1G1 sale on Russian diplomats. "Hey Lavrov, how'd you fit Kislyak in your pocket? That was a great trick!" 1. US media was not allowed into the meeting, but Russian state media was allowed. 2. 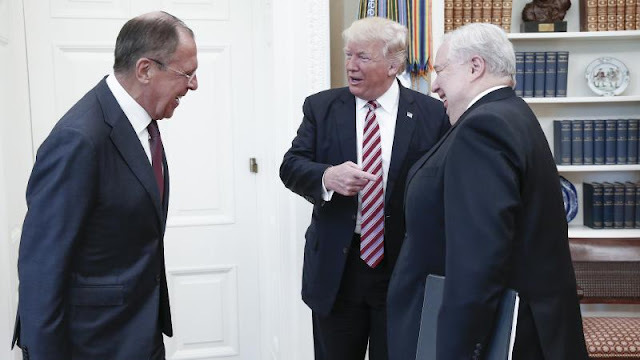 Trump, Lavrov, and Kislyak were very happy to see each other. The White House hit back, sending National Security Advisor H.R. McMaster to dispute the story by saying the story was "false. . .as reported," and that Trump did not disclose, "intelligence sources or methods." But the Washington Post story doesn't allege the latter at all! Corker's critique is that Trump just isn't disciplined enough. Not that Trump may have compromised the US and its allies, just that Trump needs to learn the rules a little better. And it gets worse from there. Miss Lindsey's right. This would be quite troubling if true because the net continues to widen. Now McMaster would be complicit in the cover-up as well. And as my friends in the military remind me every time I speak to them about their jobs, McMaster calls all of the shots now for military actions. That has meant more drone strikes and less regard for civilian casualties. If McMaster is compromised, does that imply we may be eliminating Russian-selected targets in Syria and Yemen, effectively helping further Russian interests in the region? This really could become the Sum of All Fears.